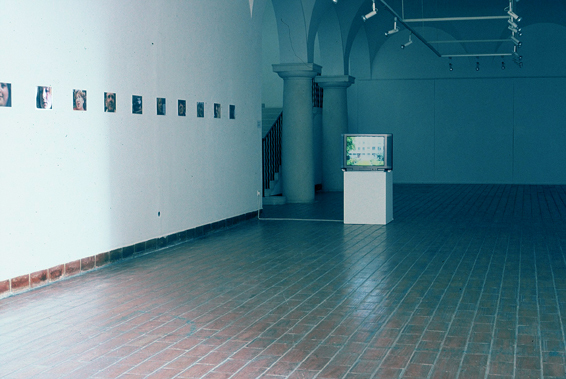 Ghost Town, a single channel video installation, 24 digital prints, Museum of Contemporary Art, Dubrovnic, Pam Skelton, 2002. Photo Jean de Breyne. 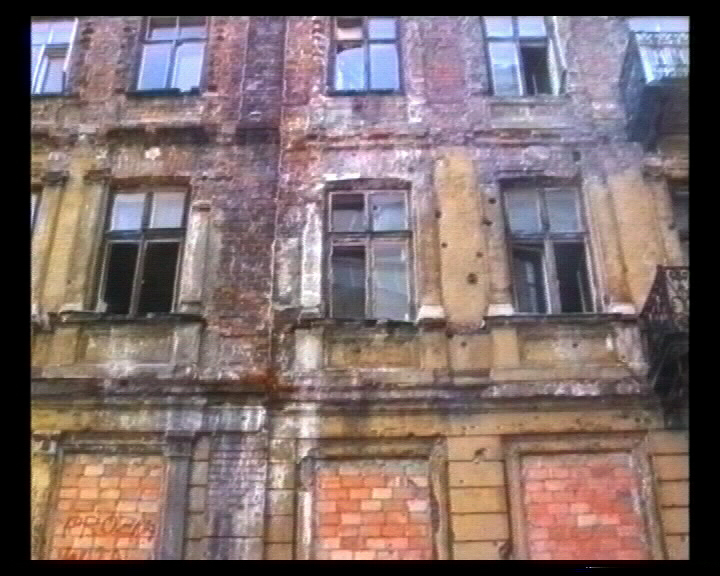 When I first visited Warsaw in 1993, I was struck by the fact that the ruins of part of the former ghetto lay beneath a housing development. The rubble of the ghetto buildings provided the foundations for the homes that were built in the fifties on top of what had been the central ghetto area, and it was this rather macabre realisation that drew me back to Warsaw again in 1995 and 1996, I was intent on investigating what remained of the ghetto architecture and with the easily obtainable ghetto map it was possible to wander within the huge swathes of the city that had been both prison and home to over 400,000 people. The names of the streets and the words of the authors of the ghetto diaries helped me to orientate and locate myself and I was surprised at how many of the crumbling remnants could still be found, especially as I had been led to believe that nothing of the ghetto had survived. 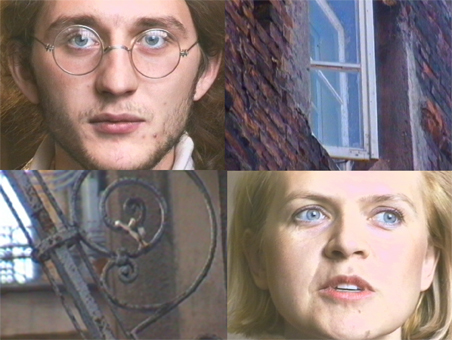 The images in ‘Ghost Town’ appear ordinary, but for example when one compares the archival photographs of people awaiting deportation to Treblinka at the Umschlagplatz with the site as it is today it is clear that the Umshlagplatz was situated in the middle of Stawki Street, sandwiched between the former SS Ghetto headquarters building and the empty buildings of a school. The Umschlagplatz monument is situated adjacent to the Mikolaj Kopernik Gymnasium of Economy the school that during World War II had been used as a waiting room for the people awaiting deportation to Treblinka. Overlooking the site on the opposite side of the road was the SS Ghetto Headquarters, a sombre grey building that since 1968 has been home to a university faculty, the Institute of Psychology. 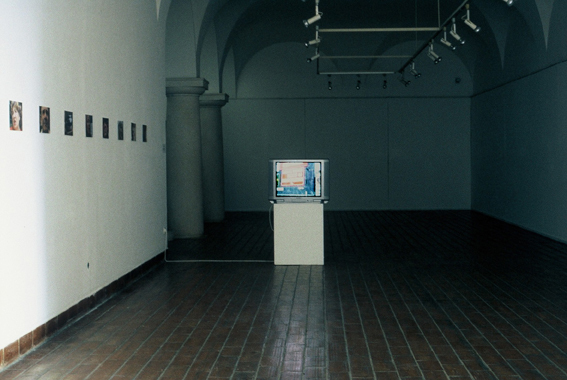 Ghost Town a video of the Warsaw Ghetto (2001) was exhibited as a solo show at the Brno House of Culture (Brno, Czech Republic): and in Perceptions at the Museum of Modern Art, Dubrovnik (2002) curated by Jean de Breyne (Fr): screened at Congress CATH (Leeds University 2002).